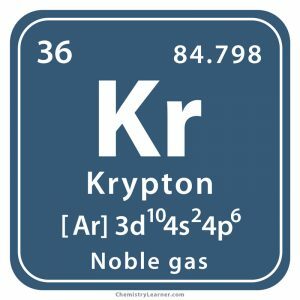 The element krypton (pronounced as KRIP-ton) is a noble gas belonging to the family of nonmetals. 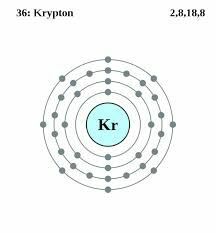 Represented by the chemical symbol Kr, it is inert in nature, not reacting with anything except fluorine . 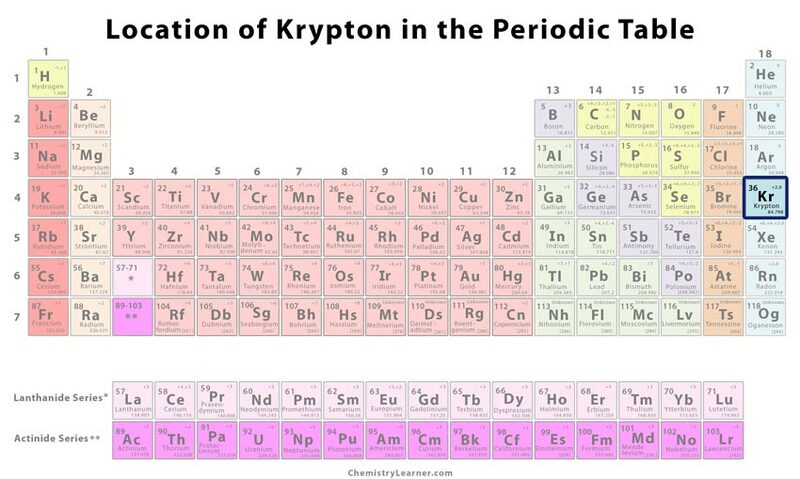 It has 33 known isotopes whose mass numbers range from 69 to 101 of which only six are naturally occurring with krypton-57 having the maximum abundance . One of the rarest gases in the earth’s atmosphere, it makes up only 1 part per million by volume . Origin of its Name: The element got its name from the Greek word ‘kryptos’ that means hidden . At the University College in London, Ramsay and Travers after discovering the noble gas argon were sure about the existence of a new group of elements in the periodic table. To find out the other elements present in the atmosphere, they carried out liquefaction and evaporation. Finally, on 30th May 1898, some heavier liquid elements were left behind. After extracting about 25 cm3 of a new gas, they analyzed in a spectrometer and announced its discovery . Kr is used in the flash lamps of high-speed cameras . It is mixed with argon and filled in energy-saving fluorescent light bulbs [1, 2]. The element is used in halogen-sealed beam headlights to enable insertion of thinner and long-lasting filaments for a greater light output . In food packaging industry, the noble gas is used in sterilization of fluids . It is used in the lithographic fabrication of semiconductors . Excimer lasers made from a mixture of krypton and fluorine produces high-power ultraviolet light that is used in eye surgery . Radioactive krypton-81 is used imaging of the respiratory system to detect abnormalities . Kr-85 is extensively used in heart stunt studies . Inhalation of higher concentration of Kr causes difficulty breathing, nausea, vomiting, fatigue, and low mental alertness . Krypton-86 was the standard measure of length from 1960 to 1983 . During the Cold War, radioactive Kr was used to estimate its production in all nuclear reactors by the Soviet Union. In fact, the Russians too their share by subtracting the amount produced in Western reactors from theirs . Kr-85 has the potential to detect the presence of secret nuclear weapons . The price of the metal may vary between $30 and $35 per gram.